In China’s cultural tradition nature played an important role in all aspects of their lives from art to medicine to daily living. Special attributes were assigned to different aspects in nature depicting their essence and defining their essential qualities. Nature was considered a self-generating, complex arrangement of elements that continuously interact with each other and change. The relationships of the elements in nature created systems of interaction that held more importance than and now versus what made or controlled them. The tradition of focusing on nature’s relationships created a philosophy which permeates Chinese Medicine. The philosophy created a fundamental difference in care management between Chinese Medicine and Western Medicine. Five Element Theory is a system of thought in Chinese Medicine that has continued to be used and evolve over the last 2,000 years. Five Element Theory concerns associations, the connections between things due to similarities. These associated items interact with each other through relationships and create natural systems. Underlying all natural phenomena is the belief in inherent consistencies. A simplistic view of inherent consistencies from a Western point of view would be that all organic matter is believed to contain carbon. In the West, scientific theory is a way of viewing inherent consistencies. A simplistic view of inherent consistencies in the East could be seasonality as a relationship of time. The relationship must be adhered too in order to support our habitat. In order to have winter, we must have the rapid birth of spring followed by maturation in summer and harvest in the fall. Summer cannot follow winter just as winter cannot precede fall. Although many ancient philosophies and medicines show a foundation on elements, not all elements are exactly the same. Ancient India and Greece utilized four elements: earth, water, air, and fire. Japanese five elements include: earth, water, fire, wind, and void. 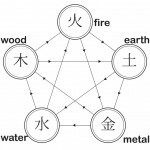 The foundation of Five Element Theory in Chinese Medicine is the five elements: fire, earth, metal, water, and wood. 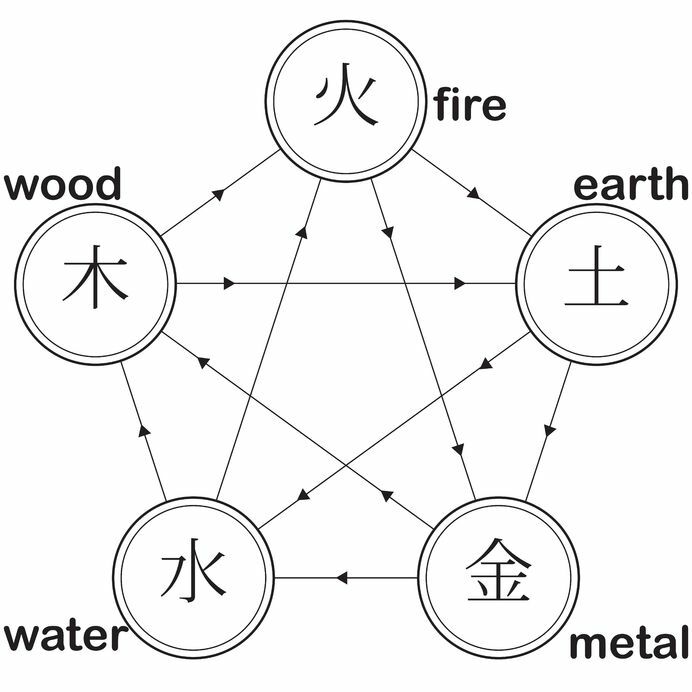 In Chinese Five Element Theory, each of the elements have special attributes which depict their nature. Fire is heat and can be warming or burning. Lack of fire leaves cold. Fire is light in weight and gives light. Fire can quickly change. Earth is solid and provides a foundation that can hold nutrients. Earth can be heavy and solid. Rocks are one example of solid earth. Stones can be resistant to change and movement. Metal is used for creating tools and harvesting. Metals are able to be molded and have different qualities and values. Water flows and easily reshapes itself. Water has the ability to break down the most solid of elements and nourish new life. Water is naturally cold unless heat is applied. Wood has an amazing strength. One large tree can lift 100 gallons of water out of the ground and hold about 400 gallons. With all its strength, wood also has flexibility and moves upwards and outwards. The elements differ from each other. By observing each of the elements, the differences can be identified. Wood has flexibility while retaining its shape. Wood is able to bend in strong winds without breaking. Wood maintains its location. Water, on the other hand, maintains its molecular structure while easily reshaping to any shape. Water is able to move great distances with tremendous force. Water prefers to move to lower levels. Fire prefers to move upwards with a quickness that is unusual compared to the other elements. Earth shows a degree of consistency and support not seen in the other elements. Earth’s flexibility differs from the other elements in that it will move out of the way of new growth while still supporting new growth. Metal is able to maintain its shape or be reshaped while still remaining a metal. It’s not so much knowing the element, but understanding the qualities and attributes which depict the nature of element that is important. The elements become an analogy which appears to be the key way ancient China communicated information and meaning. Analogy refers to the cognitive process of transferring information from a particular subject to another subject. Or an inference or argument from one subject to the next. Analogy is different from the traditional Western methods of cognitive thinking which include deduction and induction. Yet, to start out the discussion on Five Element Theory, there is always the basic chart which is usually tucked anyway in every basic Chinese Theory Medical textbook. The basic chart for Five Element Theory shows the element and its association to yin/yang organs, season, direction, taste, tissue, colors, and sense organs. The chart forms the start of most students study in Five Element Theory. Expanding on the chart, wood has certain qualities. Wood expands upwards and outwards and represents the sudden movement seen in plants in plants in Spring. Wood has extreme strength and stability which shows limited flexibility. Tendons have similar characteristics. The organs associated with wood are liver and gallbladder. The movement of the liver is upwards and outwards. Chinese Medicine indicates that liver controls the free flow of qi and must move upwards and outwards. The direction of wood is East where the sun rises. Spring is considered the start of a new day and is warmer than night but not as warm as the afternoon. In spring, supporting the movement of liver becomes important. Being the season of the liver and gallbladder, the belief is that these organs will be most active in spring. Following Five Element Theory, a practitioner may find that herbal formulations that support the liver and gallbladder are the formulas most needed in the Spring. Herbal practice is very sensitive to theory. The liver moves upwards and outwards and herbs which support the liver may be considered acrid with a temperature of warm or neutral. Acrid being a flavor which is considered uplifting and moving outwards, a light flavor. Warm is a temperature which still maintains the yang nature of spring without being excessive whereas neutral does not engender heat. The taste associated with wood is sour. Sour foods can support the liver. Yet, pathological liver or gallbladder function will have a sour taste in the mouth. Green is the color associated with wood. Green color on the skin, in the face, usually shows an inconvenience associated with the liver. An example would be green on the stomach area of the face could be liver overacting on the stomach causing acid reflux, stomach pain, etc. The basic Five Element chart introduces each element with some of the most important associations. There are more associations based on the qualities of the elements. One example of another association is the role each of the elements play in the administration of the body. Spring is a dynamic time with the need to move decisively and immediately. The liver is considered the “General”. The General, use to being in command, easily directs and coordinates movements and campaigns decisively and immediately. An ideal General is not only decisive, but shows the strength of wood along with its limited flexibility. Second guessing movements during a battle would be detrimental. If hindered, the General is impatient. Strongly hindered and the General has an explosive temper. Yet, like the sudden, decisive movement of Spring, quick explosions are quickly forgotten. There is also a pulse which is associated with wood, liver, spring. This is a wiry pulse and it is considered normal for a healthy individual to have a wiry pulse in spring. This wouldn’t be normal at other times. Each of the elements creates its own unique story based on its attributes and qualities. Using analogy, these attributes and qualities are transferred to the different associations in a similar manner as wood to its associations. Each element has equal importance due to the relationships which create systems that support life. In order to have summer, we must have fall, winter, and spring. Life regenerates and the consistencies in nature ensure that life regenerates. Each element is unique and has a role to play in our lives. As mentioned earlier, in order to have winter, we must have the rapid birth of spring followed by maturation in summer and harvest in the fall. Summer cannot follow winter just as winter cannot precede fall. Just to give more fuel to think about, water is the element associated with winter. Water, the quiet, cool, enveloping one allows us to regenerate. Winter is considered the season when the seeds lie dormant, storing their vitality in order to burst forth in spring. The earth rests and regenerates in winter. Being cool and dark like night, water represents our need to sleep and regenerate.